Eazystim is an amino acid based bio-stimulant. It is an organic bio product that stimulates the plant growth. 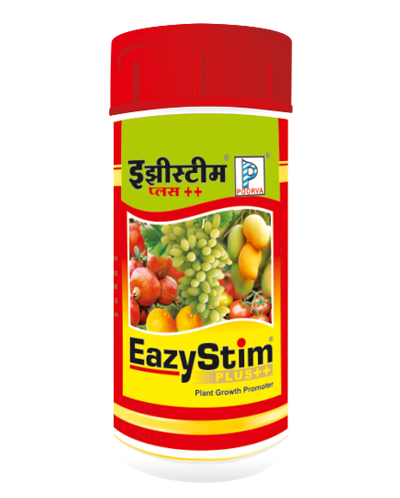 Eazystim has balanced composition of Carboxylic Acid & Certain cell growth promoting amino acids. Eazystim is an amino acid based bio-stimulant. It is an organic bio product that stimulates the plant growth. Eazystim has balanced composition of Carboxylic Acid & Certain cell growth promoting amino acids. Use of Eazystim results in healthy and enhanced growth. It increases the fruit set and size of fruit to a considerable extent. It gives very good results with GA3 in dipping of grapes. It is helpful to increase the yield of crops. Applied at flowering stage, fruit set and fruit development. Grapes, Pomegranate, Mango, Citrus, Tomato, Cotton, red gram, Bengal gram etc. 0.5 to 1 ml/ltr of water.